Mark T. Frost’s new book, God's Alarm Clock - The Nation of Israel, ($12.99, paperback, 9781498461214) reveals to people living in a secular society the basic tenets of a faith they casually lend their allegiance to but the central doctrines of which they don't truly understand. Mark explains to readers that the nation of Israel has played a significant part in the history of the world, as God’s chosen nation. As a response to the growing anti-Semitic climate in today’s culture, this informative text sheds light on Israel’s vast historical and religious importance. The Bible makes very specific claims for the promises God made to the nation of Israel concerning its future. Mark presents an all-inclusive view of relevant scripture with incredible biblical facts behind Israel’s history and future. The book is presented in a simple and easy to understand manner, the basic beliefs and ideas that have laid the foundations and morals of the society they live in, namely the western one, and make these doctrines interesting, exciting and a thrill to live out. This book is intended for use as a textbook, study aid, or outline for sermons. Mark T. Frost was born and raised in Cape Town, South Africa. At the age of twenty-three and in pursuit of the Truth he started to read the Bible, a search that resulted in a meeting with the Lord of the scriptures Himself, Jesus Christ. A fervent student of the Bible with several years of Bible studies behind him, the author and a colleague went to Mozambique in 1989 to start training church leaders in that war torn country. Very early in his missionary calling, Mark had a vision for the unification of the Church, the worldwide body of Christ. In cooperation with several international Christian organizations having as their main thrust leadership training within the church, the work steadily grew to include all denominations, both mainstream and independent, in the capital city Maputo. By the time Mark left Mozambique ten years later the work had expanded and covered most of the major districts in southern Mozambique. Having read the Bible from cover to cover a dozen times or more, and reading through the New Testament once every three months for the last ten years, gives Mark T. Frost an insight and overview of the central message of the Bible, namely God's plan of the world's redemption through His son the Messiah or Christ, Jesus. Reading the Bible in this manner makes the context and the greater context that the different books, chapters, letters and any given text are written in, clear. The reader sees the uniformity, symmetry and divine mind behind this Book of books, still very actual today. Xulon Press, a division of Salem Media Group, is the world’s largest Christian self-publisher, with more than 15,000 titles published to date. 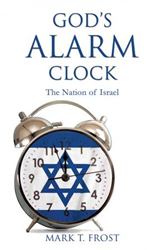 Retailers may order God's Alarm Clock - The Nation of Israel through Ingram Book Company and/or Spring Arbor Book Distributors. The book is available online through xulonpress.com/bookstore, amazon.com, and barnesandnoble.com.